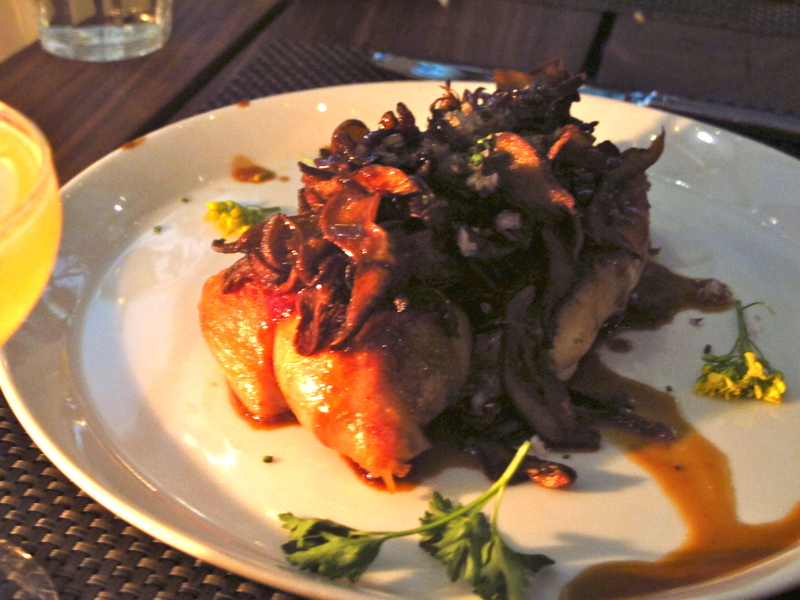 Last week I found myself with a handful of local writers and bloggers for a sit down dinner at Sadie in Hollywood. Chef Mark Gold of Eva Restaurant has been shaking things up in the Kitchen at Sadie, and this event was to showcase their new Spring Menu. Our table was in the courtyard area which I was excited about as I hadn’t yet experienced this area of the restaurant. 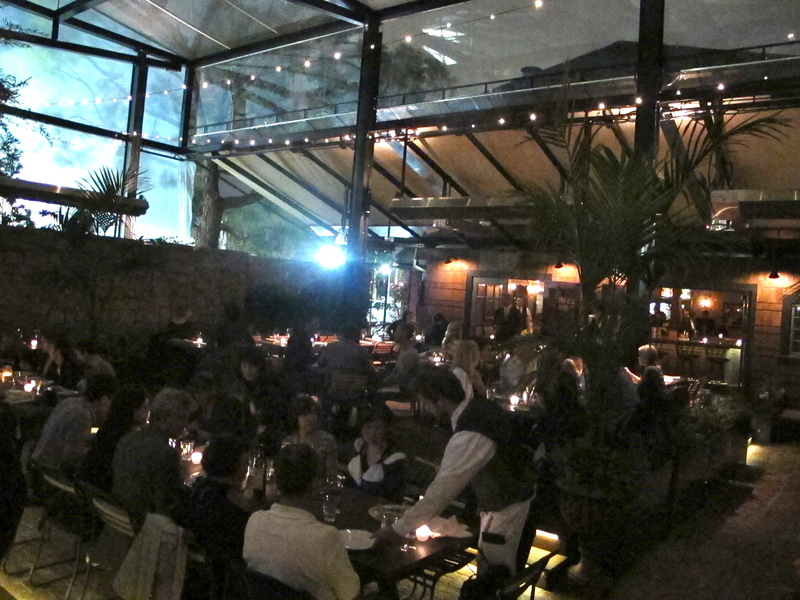 Despite the chilly evening we were kept toasty warm by the outside heaters and new overhead awning. The place has a romantic setting, especially the spot lit water moat that surrounds the patio and creates movements of light on the stone walls. Each food item on the menu was carefully paired with a drink, designed and created by the talented bar staff. Giovanni Martinez in collaboration with a number of team members at the bar have made a truly wonderful and varied drinks list. I have mentioned the bar scene in previous posts so I won’t go in to too much detail again, however I will say that I am never disappointed with the drinks at Sadie. Our feast began with a delightfully refreshing drink called Temperado, which had a fresh taste and a subtle cilantro flavor that cleansed the palette before eating. It had some heat to it from the Jalepeno, but it wasn’t overly spicy. The first dish to come out was a mini salad called a ‘Little Gem’. It had a lot of flavor for its small size. The crispy ham, crunchy lettuce leaf and creamy garlic sauce complimented each other beautifully. Next came an organic egg, described in the menu as ‘representing Spring’, which had a beautifully runny yolk, a hollandaise style sauce with peas and pansies (the flower!) and a grilled spring onion. It was another very tasty little bite size appetizer. After these first dishes we tried a local Heffeweizen (by Golden Road) and the Piscoteca drink. The cocktail was interesting with ginger and honey notes, it had a bright flavor from the Yuzu and Lime juice but the citric acidity didn’t mask the Pisco and the drink itself was nicely balanced. A selection of share plates appeared for the table and we were able to sample the Pork belly, Pei mussels, Lamb meatballs and Oysters. All the starters were tasty, although my only complaints were that the meatballs seemed slightly over seasoned and the Yuzu Kosho salty spiciness on the pork belly was a little too overpowering for my tastes. These two dishes were by no means bad, they just didn’t appeal to me personally. The mussels however were wonderful and there was a definite sweetness to the dish. It was creamy, rich and the Chorizo pieces gave a nice texture. Our Entree choices included Chicken, Fish, Pasta and Steak. Seeing as everyone at the table was a writer/food critic/blogger etc we were all more than willing to give each other tasters of our dishes, so I had a chance to try them all. The Chicken was wonderful. 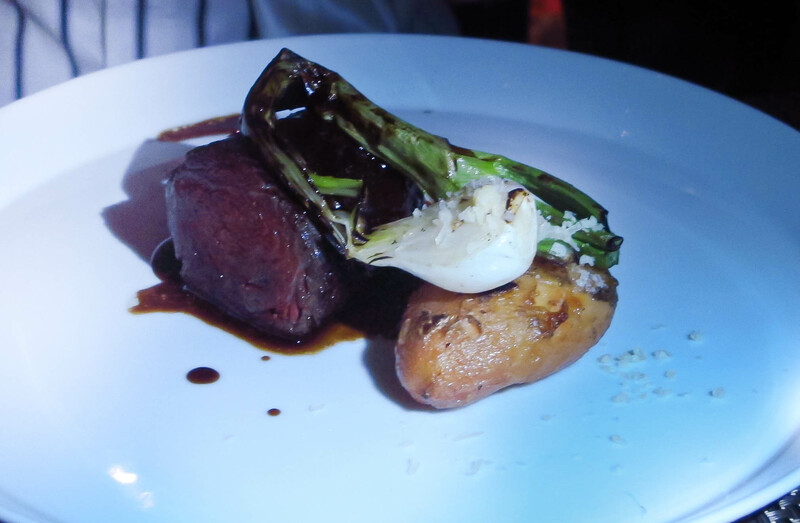 It was flavorful, juicy and had crispy shallots on top that gave a nice textural element. I didn’t really notice the mushrooms, but I only had a small section of this meal and it may have been more prominent if i’d eaten the entire dish. 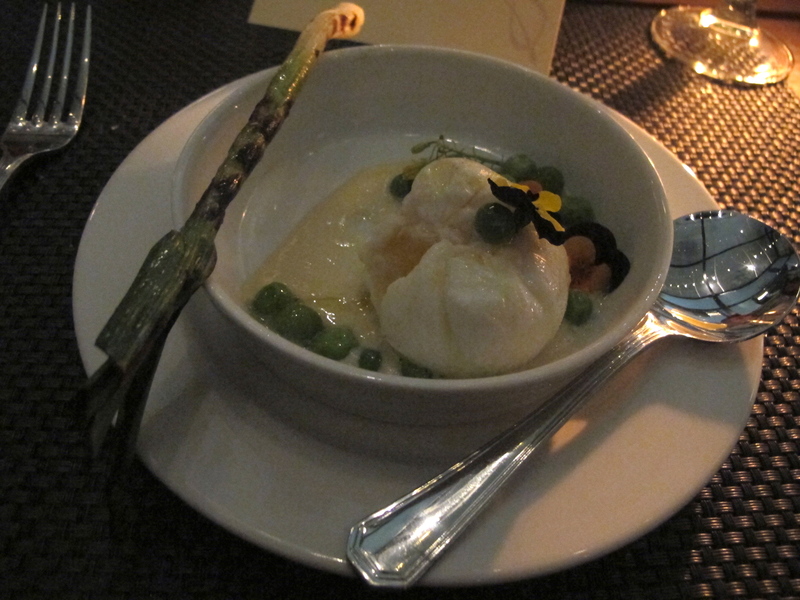 The Halibut was fantastic, my favorite of all the dishes. It was light and flaky, not at all fishy or dry and the grilled asparagus was an excellent accompaniment. Bacon pieces and an Onion relish gave a light sweetness that was a nice addition for the fish also. The pasta dish was a ‘Linguine with Clams’ which I found a little too citric for my tastes and had almost a white wine vinegar flavor going on, everyone else seemed to enjoy it but it wasn’t what I expected. The steak was good, the meat was tender and well cooked and the vegetables were tasty but the dish itself didn’t Wow me, it was just OK. Drinks paired with the meal were all great and bursting with interesting flavors. 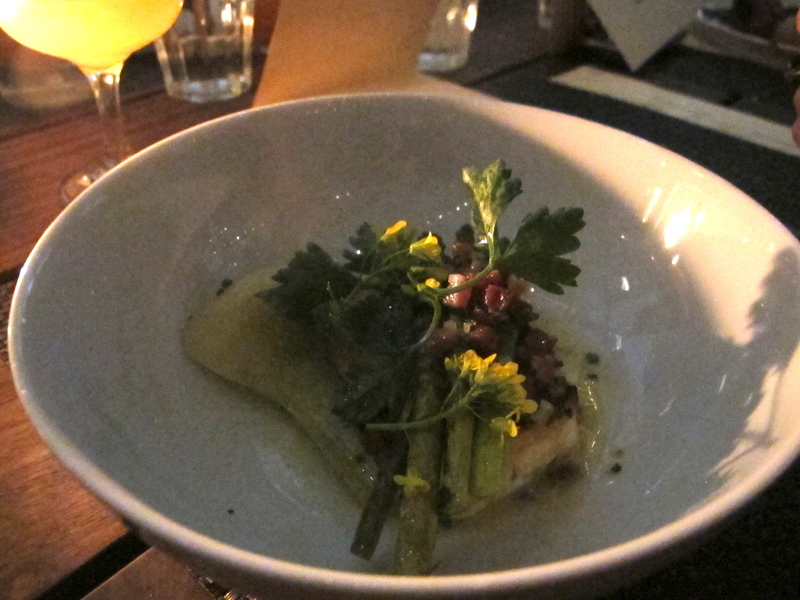 My favorite was the drink that paired with the Halibut called ‘Friar Fresh’. It was such a simple but easy to drink beverage and had just the right combination of sweet from the honey and citric from the grapefruit. I highly recommend ordering that drink. At the end an array of desserts appeared, including Doughnuts (made in house). 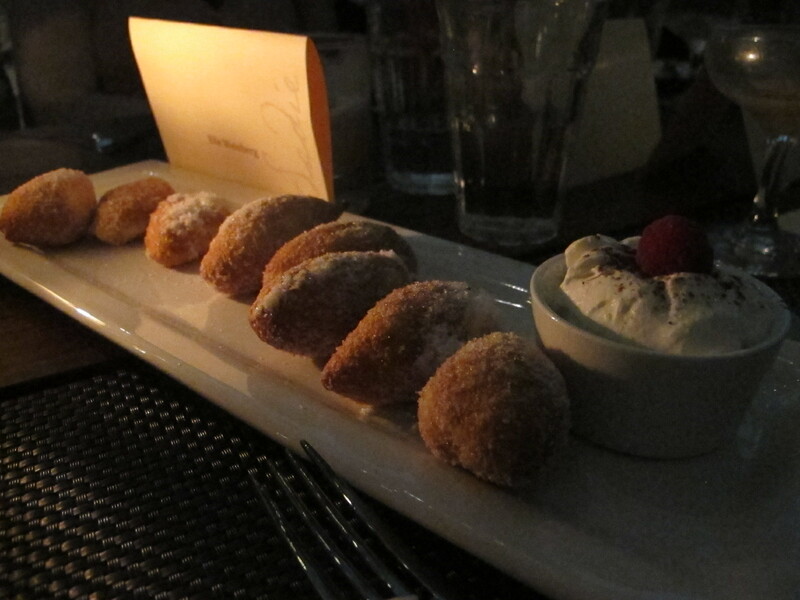 The doughnuts were delicious, and reminded me of beignets but with crystalized sugar as apposed to powdered sugar. They came with a creamy irish coffee cream dipping sauce that tasted like a thick version of Baileys. Yum! The best dessert in my opinion however came in the form of ‘floats.’ I could (and probably will) write an entire post on these floats alone. The ice-cream mixed with bitters was just divine. It was creamy, sweet with just the right amount of a bitter twist at the end of each sip. The chip was also tasty, and the Mexican coke gave it a nice bubbly sweetness. Both reminded me of ‘Ice Cream Sodas’ I used to drink in the summer in England, they were refreshing and will be a great drink to sip on in the sunshine. Overall the entire meal was a huge success in my opinion. I have returned to Sadie on several occasions since it opened, with the intention of writing a review, however I never really had any dish that excited me enough to write about it. This tasting evening, with the addition of Chef Mark gave me the kick to want to write about them. The food is no longer good, it’s great and the drinks having always been nothing short of excellent, are now truly outstanding. This place should be packed with customers and as soon as word really gets out, I believe it will be. From the gorgeous decor to the friendly staff, the romantic ambience and now the food that matches the fantastic drinks…this is nothing short of an excellent night out. Drinks get my highest rating now, due to the addition of the truly imaginative and incredibly tasty floats. All the bartenders know their drinks from Classic to Contemporary, everything i’ve tried has been balanced and interesting. All of the dishes and cocktails I described in this post are currently available for Spring time at Sadie. If you haven’t been already, I suggest you make your way over there soon, if only to enjoy one of the delicious floats on the patio.